Summer I hear you say? Where is the sun hiding is what I want to know. So what better way to get excited for summer than having a look at some summer trends! Today on my blog I will be discussing the latest from PARFOIS. Not familiar with this brand? 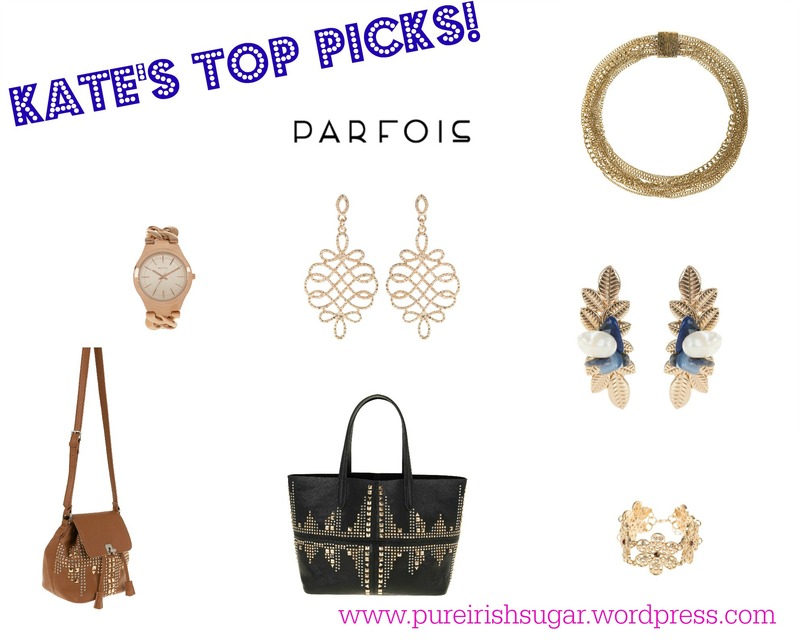 PARFOIS is a really trendy accessories store and have stores in Blanchardstown Shopping Centre, Pavilions Shopping Centre and Mary Street, Dublin; Crescent Shopping Centre, Limerick; Mahon Point, Cork; T1 Dublin Airport and online at parfois.com. Their prices are really affordable and you can pick up some really funky pieces. So lets take a look at some of the key pieces for this summer that I have chosen from PARFOIS. If you know me then you know that I am all about the statement necklace. I think it is possibly the best thing that has come into our fashion lives and I rely on statement necklaces to funk up my day time outfits. 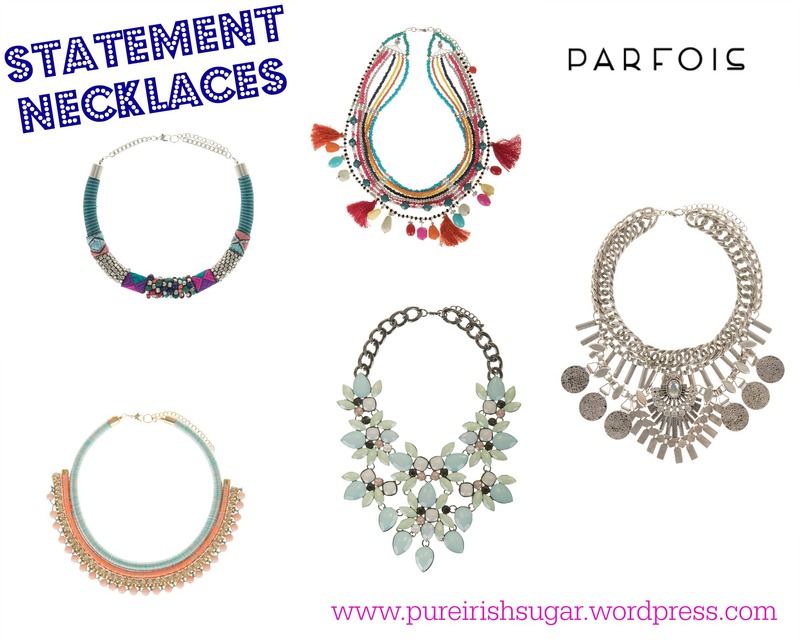 PARFOIS have some really funky statement necklaces from their Ethnic trend. As always you can’t go wrong with florals. I have a few festivals lined up for the summer and I know that I will pick up a few of these. Headbands are perfect when you are having a bad hair day or again want to look super cute and funky! The first one I have picked would look so sweet for a wedding. What I want to buy from PARFOIS. Well I want to buy everything I have featured but these will be my first purchases. I love anything with gold in it, especially handbags. PARFOIS are known for their handbags and the two featured below I just love. I have shoes that will go perfectly with this tan bag and I can’t wait for it to be mine. I know gold chains were very last season but I will continue to wear them and love them. I had a pair of black shoes on last night with a chunky gold chain and this watch would be perfect with them, you can see what I wore on my instagram here. When I am not wearing a statement necklace I am wearing big earrings. This doesn’t happen too much but I really like these picks from PARFOIS. Be sure to check out PARFOIS on twitter and instagram! 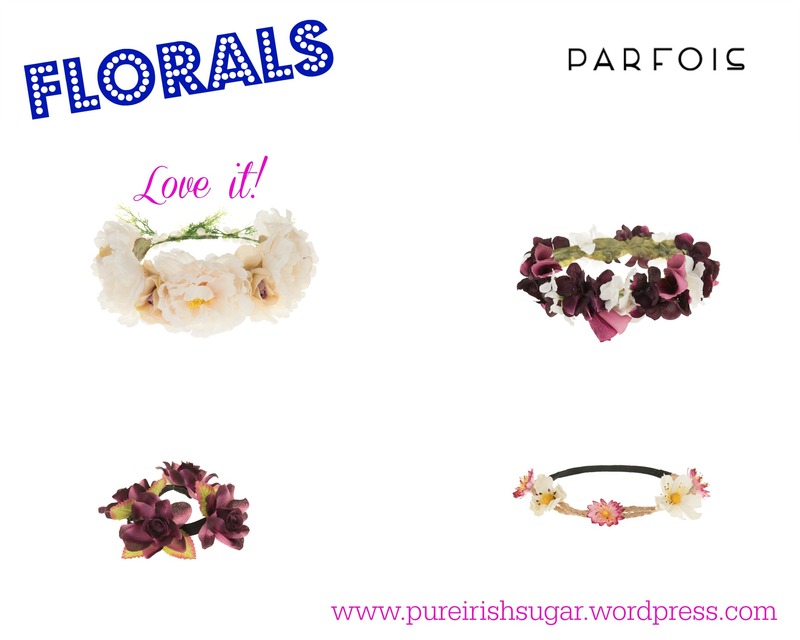 Let me know on my Facebook (Pure Irish Sugar Blog) what you think of what I have picked out! Posted in FashionTagged assessories, Fashion, Festival Fashion, Hand Bags, Parfois, Parfois Ireland, Parfois Picks, Statement NecklaceBookmark the permalink.